Birch is big. 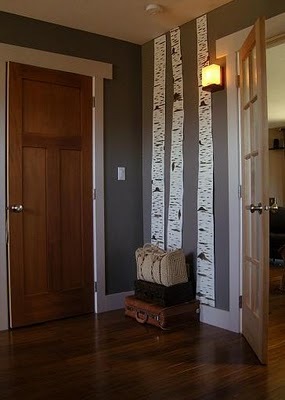 But if you can't afford Cole & Sons Woods wallpaper, there are three DIY projects that give you a bit of birch for less. Courtney at And Then There was Home made a freehand birch wall mural using white paint. Elizabeth Abernathy made birch wall art out of cereal boxes. Get the project at Curbly. 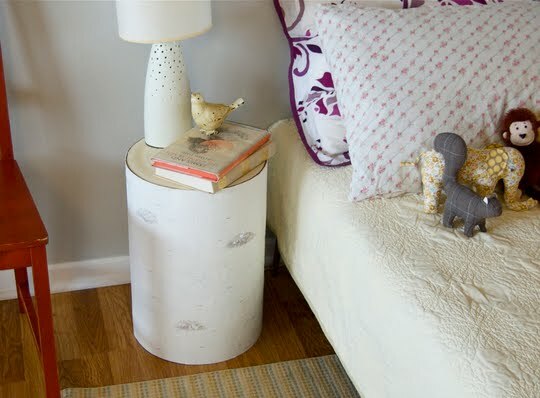 Katie Steuernagle at Ohdeedoh made a faux birch log side table out of, among other things, wet toilet paper. A word about this last project. Some of you may be thinking, why not just get a birch log instead of faking it? From personal experience, I know it can take years to find a stick let alone a log in Brooklyn. I eventually did my own DIY birch using . . . birch. However, I got it from the trash, not the forest. The glamourous city life. Thanks for including my birch trunks! I like them so much I've kept them up on the wall in my bedroom for months now. I really like the log side table. I never would have guessed that toilet paper entered in to it. And, I have to ask, do you still have those (real) birch logs in your apartment? I can only imagine the ordeal of hauling those home. Those are great-cereal boxes-really? Thats impressive! Toliet paper really? Cereal boxes? I like these kids of DIYs. Thats why I love you. I'm super-impressed with the freehanded birch trees -- quite the artiste. Nice. 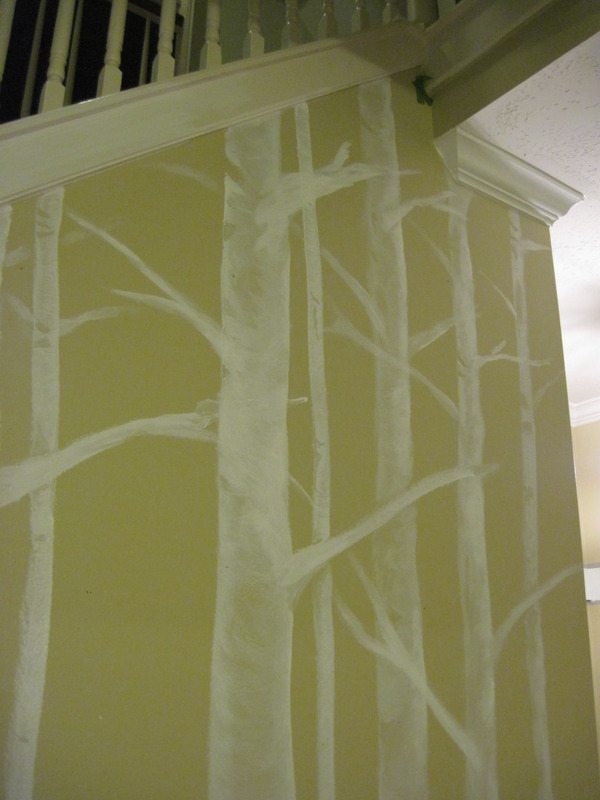 I am trying to come up with something to do behind the bed, and yes, I did consider a birch mural. But yes, they are damned expensive. So timely, the one I like most is the freehand, but of course mine would come out looking like a 3 year-old made it. Probably will just cover some old frames with cool fabric and do a little mural deal, add some color. 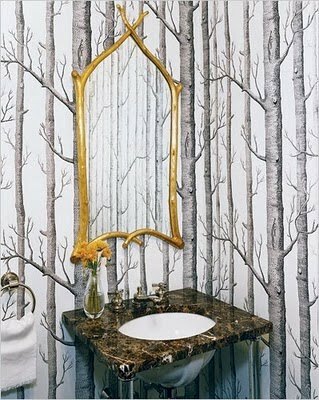 Love the birch trees - especially the wallpaper in the first photo! Fabulous! seriously? that side table is made of wet toilet paper? wow. Elizabeth, I still have the birch logs, and they were an ordeal to haul home and get on the elevator and deal with sceptical looks from my neighbors. 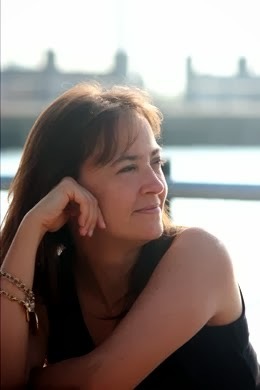 Shari, I'm sure you'll come up with something amazing. Show us when you get it done. Cristin, toilet paper was indeed one of the supplies. It was used to make the birchy texture on the outside of the table.